Pierre Renault in rec.photo.darkroom posted a very interesting method of optically centering a print on a mount. The original source seems to be Black & White Photography by Rand and Litschel. Here is my equation that determines the print position mathematically, and a script that graphically illustrates the results. > Here's how to automatically optically center any print on any board. > piece of paper the same size as the desired cut-out. > vertical line you've drawn to the right edge of the board. > Place the lower right-hand corner of the print at this intersection. > This works first time, every time. An optical illusion occurs if a print is absolutely centered on a board. This illusion makes the top border of the board appear larger than the bottom and gives too much visual weight to the top. Optical centering is a technique to overcome this illusion. It allows for more space at the bottom of the board, in a direct relation to the size of the print, and establishes a firm visual foundation for viewing the print. It is commonly agreed, and obvious even to the most untrained observer, that a print centered on the vertical axis appears to be too low on the mount. This print placement creates an unfortunate optical illusion that the print is not equally spaced at top and bottom . . . . In other words, the print seems to sag below the vertical center. One accepted technique involves placing the print near the ‘optical center’ of the mount . . . . There is a natural tendency to apply our experience of gravity to images and image frames. As we’ll see in Chapter 3, verticals express a gravitational pull downwards, while horizontal bases provide a supporting flatness. More discussion at the largeformatphotography.info forum thread, Matting prints centered. The following script calculates the print position using any of several formulas, and illustrates it graphically. The units are arbitrary. Fractions are optional. Include the space between the mat and print edges if appropriate. Extra space at the bottom is optional. Rabbet width refers to the inner edge of the frame that overlaps the edge of the mount. 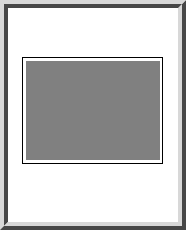 In the illustration, the frame stock is 2x the width of the rabbet. Lock print aspect ratio allows you to easily adjust the size of the print by changing either of the dimensions. Draw/save saves the entered dimensions, which you may later restore. Sometimes optical centering results in the top margin being narrower than the sides. In that case, you will probably want to use one of the other centering options. The mat ratio, or the ratio of the top mat width to the sum of the top and bottom mat widths (0.5 when the print is vertically centered), is an alternative to optical centering. I tend to like a value of about 0.45. Custom top mat allows you to move the print up and down on the mount. Click the arrowheads beside the fields to increment the values, or click and drag the print with the mouse. How big should the mount be? It is ultimately a matter of taste. I myself dislike mounts that seem overly large; there is something pretentious about them. But a good image deserves a little “personal space.” One option is to use the golden ratio (Φ ≈ 1.61803), which dates back to Pythagoras and is considered an aesthetic ideal. If the ratio of the mount dimensions to the print dimensions is the golden ratio, then the ratio of the mount area to the print area is the golden ratio squared, or Φ2 ≈ 2.62. The area ratio is displayed above when calculating the print and mat dimensions. I have used the entire visible mount area, minus any excess space at the bottom of the mat ( = the white area in the illustration at right), as this seems to determine the overall impression. A good range is maybe 2.3 – 2.9. Note that scale influences the effect of the mount size. The golden ratio works best for prints viewed from a distance significantly larger than the image diagonal. I once had a print on my office wall that was scaled to exactly Φ2 on a 32 × 40 inch mount; the mat widths were almost 7 inches. From close up, they looked way too big; 5 ½ inches looks like it would have been plenty, consistent with an area ratio of about 2. But from a distance, the impression changed and the wide mat started to look more appropriate. The reverse is true for tiny prints on hand-sized mounts. Use the resize functions to resize the print for the mount, or to create a mount for the print, based on the area ratio. When resizing the print, its aspect ratio is always preserved. You may adjust the mount’s aspect ratio by entering a number or clicking the arrowheads; or click “print” to use the print’s aspect ratio. Equal all around resets the mount’s aspect ratio. Click the arrowheads beside scale the display to adjust the preview size. The centering and resizing functions in the upper panel (except for custom top mat) are based on the visible area inside the frame. The print position and mat widths in the lower panel are relative to the mount itself. The inches to cm option is for those who prefer to use inches for the overall material dimensions (the upper panel), while at the same time measuring the mat widths and print position in centimeters (the lower panel). This technique is only a good starting point, and not an automatic substitute for accomplished design or personal preferences. If placing the print at the optical center results in an unattractive, narrow border on top or bottom of the print, additional vertical adjustments have to be made. Setting a peferred mat ratio may give more pleasing results, as well as providing a more consistent appearance from print to print. The optical centering technique does not work well with the mat ratio method. For example, beginning with the default mount and print sizes for the script above, and using optical centering, resizing the mount (20 × 36.5) so that the area ratio is 2.62 and the mat ratio is 0.45 results in the tall, bandage-shaped configuration at right. 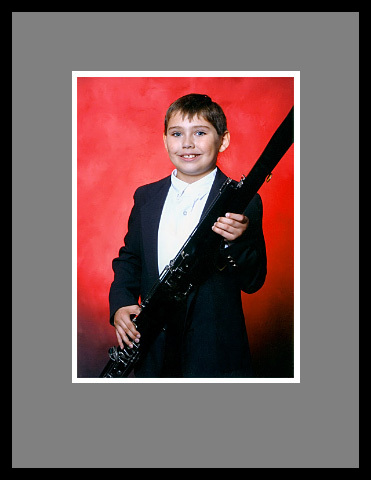 Resizing the image (18 × 13.35) rather than the mount results in an even more bizarre horizontal-on-vertical configuration. None of the functions above combine optical centering with the mat ratio. Some members of the Photoshop community have tried the optical centering concept, by expanding the canvas then centering the original image on a virtual mount. See Photoshop User TV: Episode 253 for a demonstration. Here is a photoshop script, Optical_Centering.jsx, that should do the job. It should be fairly self-explanatory. 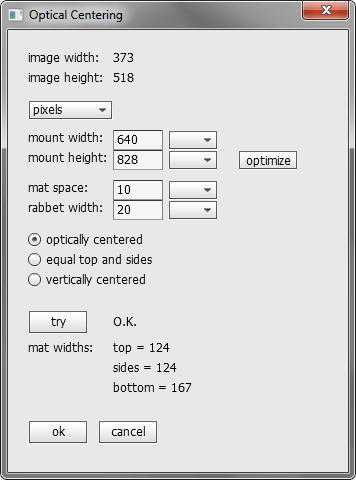 After entering a mount width, “optimize” calculates a height for which the optically-centered mat has equal top and sides. 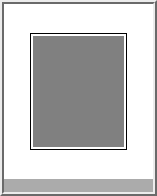 If you enter a mat space, the mat is colored gray so you can see the space. You can recolor or uncolor it as needed. If you enter a rabbet width, the hidden edge of the mount is colored black. Press “try” to display the dimensions before running the script. Tested in CS2 and CS5. 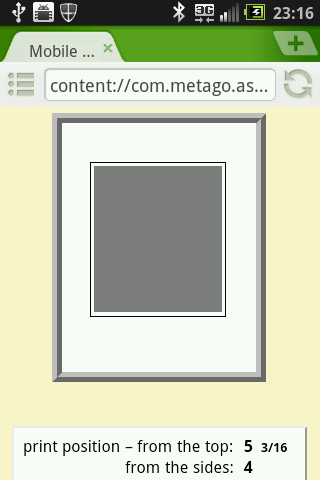 You may need to flatten the image first. Settings are saved to an .ini file in your default user folder. Updated 2/1/2011. Just to point out, if you are wanting to print an image optically-centered on a mount-sized piece of paper, you might try calculating the print position, then using it as the top margin in the print dialog. © 2017 by Russell Cottrell. Updated 12/11/2017.